The Land Rover has one of the most complicated transfer cases ever produced. Depending on the type of Land Rover you have, you could have a completely different transfer case compared with a similar model only a year apart. There are about 10 different versions of a Land Rover transfer case and we have the one that you need in stock now. We have these in both used and rebuilt styles to offer everyone a fair deal. When Ford owned Land Rover, it was easier to get parts when you needed it. You have likely ran into snags getting the drive train assembly you need, but you can find what you need here at this website. As the second oldest 4×4 in the world, the Land Rover and its counterpart the Range Rover are complicated pieces of machinery. The complex designs in these British designed 4WD vehicles is one of the reasons the drive train parts are hard to come across. Rest assured that what we have in stock will work for you. It does not matter if you prefer a used one or one that is rebuilt by us. All of our parts offer you the highest quality that you can find from an online or offline seller. We work hard and still save you a bunch of money. You value your Land Rover or Range Rover and you want it to operate correctly. Without a transfer case, you will find that this would not be possible. The permanent 4WD system is complex and unlike something that Chrysler or Jeep manufactures. 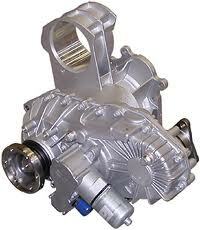 We warranty all of the housings, labor and parts that are included with every complete transfer case. This includes the new or rebuilt ones. A used transfer case still comes with our standard warranty and is checked out by our expert rebuilders before it is put up for sale on our website. You always get high quality in our drive train units. We take rebuilding transfer cases for sale seriously. Each unit is cleaned externally and opened up for examination inside. There are many delicate parts that could be damaged or nearing the end of their life cycle. We still clean the inside and all parts before we decide which ones should be changed out. This is one way that we are different. We start from scratch and make sure everything is cleaned before we start our evaluations. We test or remove gears, couplers, magnets, gaskets, bearings and other parts inside that control inner workings of a Land Rover drive train assembly. All cases are assembled back together and tested for leaks and proper gear spinning. When each unit is perfect, this is what you find in our LC transfer case inventory. Get our lowest price right here on the www.transfercasesforsale.com website. Choose your make and model then click to submit. Your price is displayed without any waiting period. If you want to call and ask us questions, call (888)-508-7153 and we’ll be happy to help you. We are professionals and you should not have to miss out on getting the part you need or pay too much elsewhere. Get our pricing now.